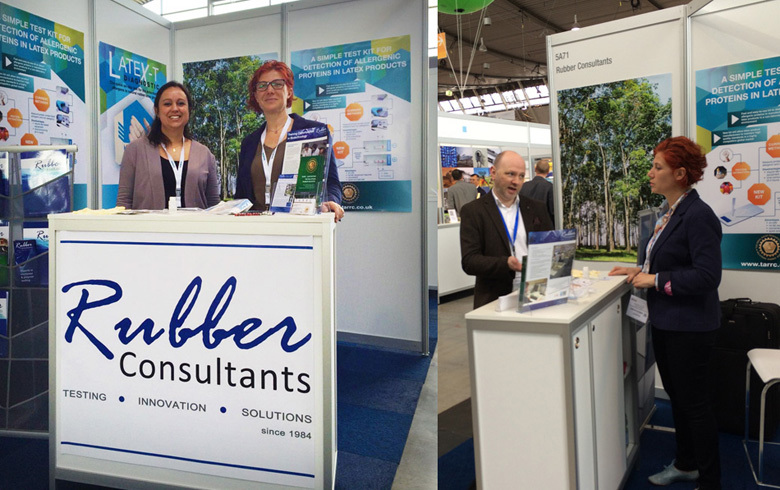 TARRC/Rubber Consultants exhibited for the first time at Medtec Europe 2016 at Messe Stuttgart, Germany from 12th-14th April 2016. Medtec Europe, entering its 15th year, is the main european show for the medical device manufacturing and supply industry. TARRC/Rubber Consultants promoted our consultancy services to the medical devices industry as well as showcasing the Latex-T test kit, a testing kit for detection of allergenic proteins in latex products. The test is rapid and simple and can be performed without specialized lab skills. The Latex-T test kit does not require any lab-based instruments, thus allowing on-site monitoring of latex allergens at ambient temperature. For more information please contact Dr Alessandra Di Cola at info@rubberconsultants.com or call +44 (0)1992 554657.